Fitted initially in my FJ 1100, and I transplanted to my 1st 1200 when I trade the 1100. (All the FJ seats are interchangeable). It was the Gunfighter model. Necessary if you (like I did) would like to test your FJ in a GP circuit, because the pegs touch very easily. Be careful, because the next thing to touch the floor is the original exhaust silencers. I bought one flip-up type from MRA. There is not turbulences between screen and rider, and, more important, no turbulences at all between passenger and rider until around 140 km/h. Above that speed, simply I can't recommend it. And the vision when at sporting mode or on night is not clear and lightly distorted . My 1TX brings with an optional Yamaha longer screen, offered in some markets. The main difference with any other flip-up screen is that the air flow is perfect inside the burble created for the screen, with no fuel or oil smells in traffic jams and with no parasit noises from the wind. After a little incident in July, 2007 in Portugal involving my back, sand splash on the road and the hard tarmac, I changed the screen for one of this company. It is fantastic, because REALLY their screens is optically perfect. 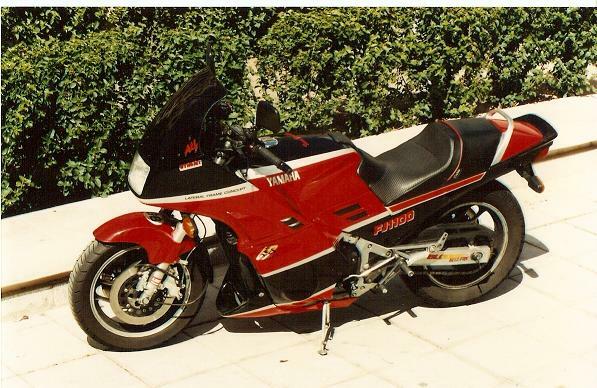 I had tested before, because I fitted one in my FZR 1000, with fantastic results. RECOMMENDED! Cheap and easy fitting solution to prevent stone damage to your fork legs. Recommended. TCP make them. Simply fit them with tie-zips and ready!. I bought it from the FJOCUK. In my model, 88, you can't fit it unless you change the original handlebar grips and cut a piece of the inner accelerator tube to make space between the switch hose and the brake master cylinder ... at this point, I didn't continue fitting it, but I think you must change the handlebar ends too. So I ordered a Vista Cruise Control. Fitting is excellent and in minutes (mine is a 90 model). 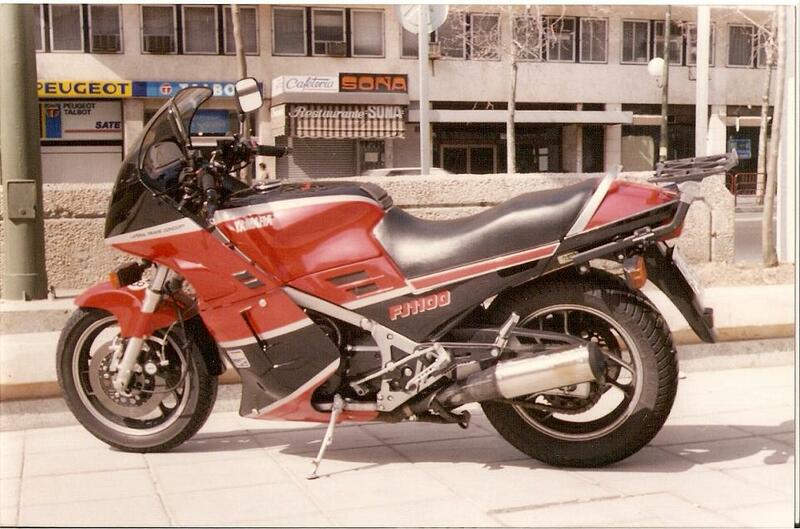 The FJ original grips are too large, and rubbed against the Vista Cruise and prevented the throttle from closing. I cut down the excess rubber with a xacto knife and, obviously, I ruined the grip, so I bought another pair of shorter grips. 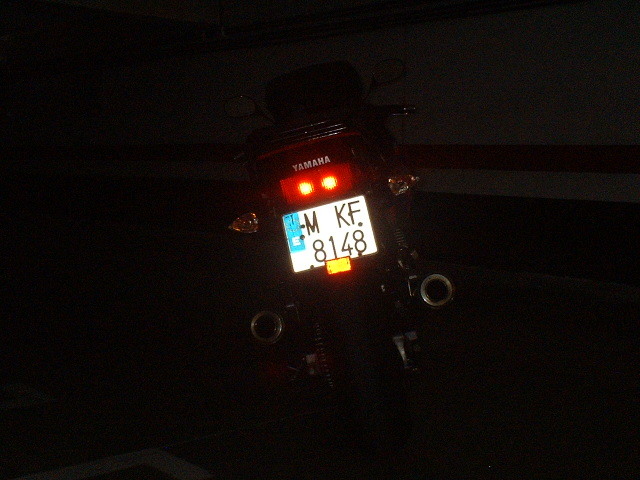 You have to dismount the fairing to install it (a pain in the arse in my 3CV FJ) but it is worth the effort, because I can fast ride when night comes without problems, even at more than 200km/h. The difference is awesome. Recommended. 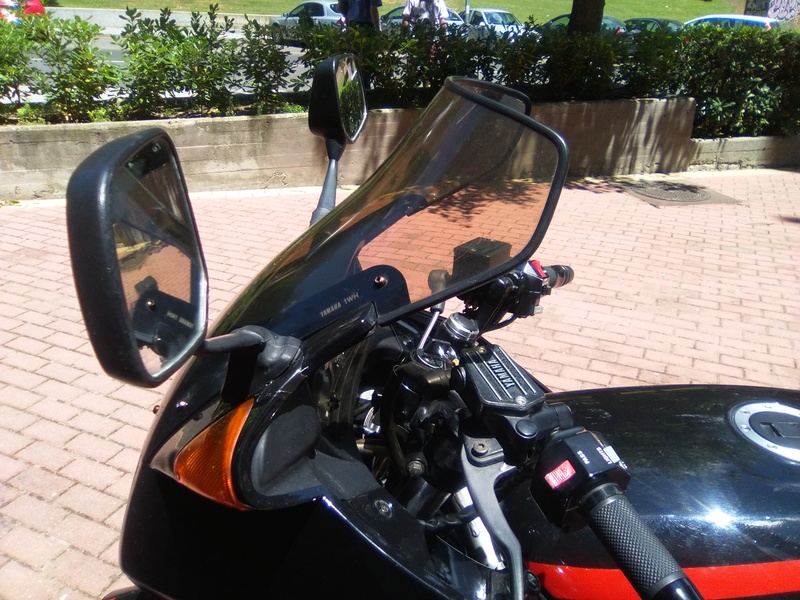 (Take a look at the dashboard pic, up on this page) I bought them from http://www.motorrad-ranch-rellingen.de Excellent finish. You can see them at the Control Cruise photo, that shows too the dashboard switch. 2.017 Update: unfortunately, the website has disappear. What a pity! The dashboard bulbs burn by temperature due to being always on, and when a good light is needed by night there is few intensity. To change those bulbs is 1 labour work minimum, with lots of parts and screws to simply arrive to extract the dashboard. And each time I dismount the fairing I find any tab broken due to the vibration. This is common to 3CV and 1TX series. An, why do it take the dashboard lights on by daylight?. 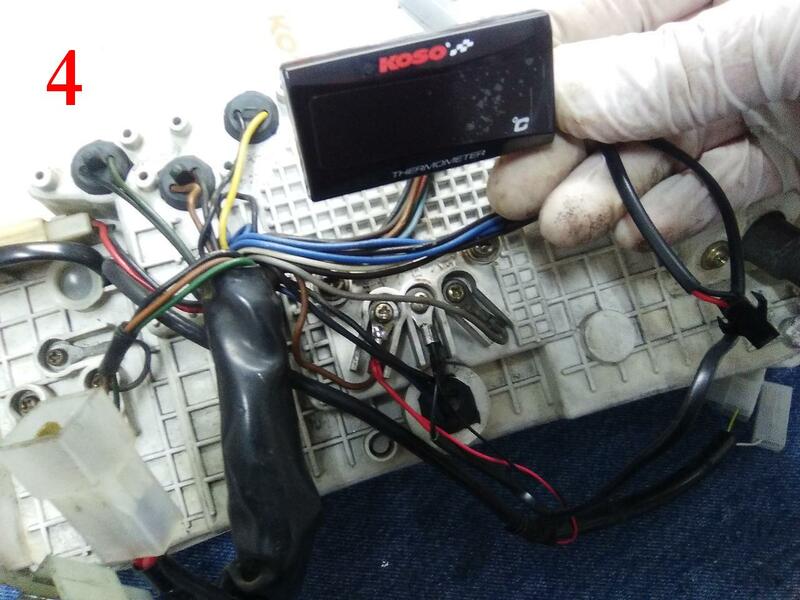 You must look for the blue wire on the dashboard, signed at the photo with the screwdriver. You can see at the photo how Mingo installed the plug with red wire. Then, fix the switch to the left side panel. Mingo fixed it with Nural 25 to add resistance to avoid the panel break with the continued switch use. See the plug added to the switch at the photo. Then, guide the wire from the dashboard to the left side panel. The 2 plugs let you dismantle the left side panel and the dashboard leaving the intermediate wire fitted in place: genius! . The switch location is thought to use the switch safety when on riding the bike. The pic show my friend Mingo's FJ dashboard. Simply fit the clocks from a XJ 900 1991 on inside the FJ instruments box. You could install the plastic surround with the idiot lights, but the FJ own look like more quality. XJ 900 to 93 rev counter show 9.500 rpm. redlines, like the FJ OE. This mod repairs forever the FJ fuel dancing issue. 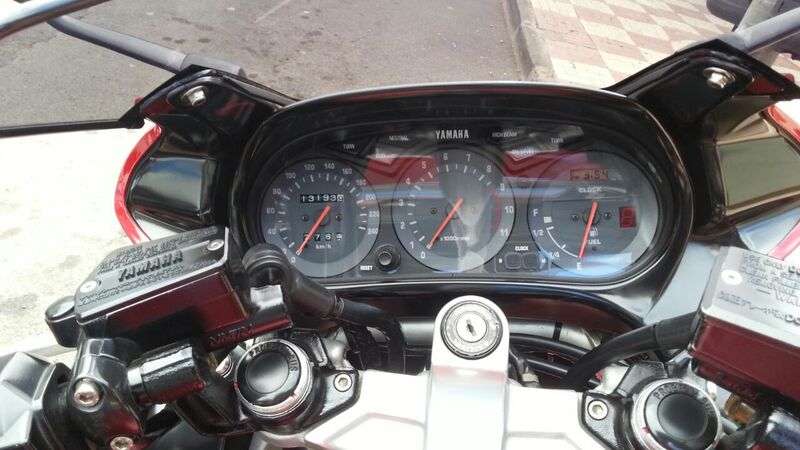 The oil temperature gauge installed instead of the crankcase refill oil is uncomfortable to read because of the place where is fitted oblige to apart the attention from the road to look at. 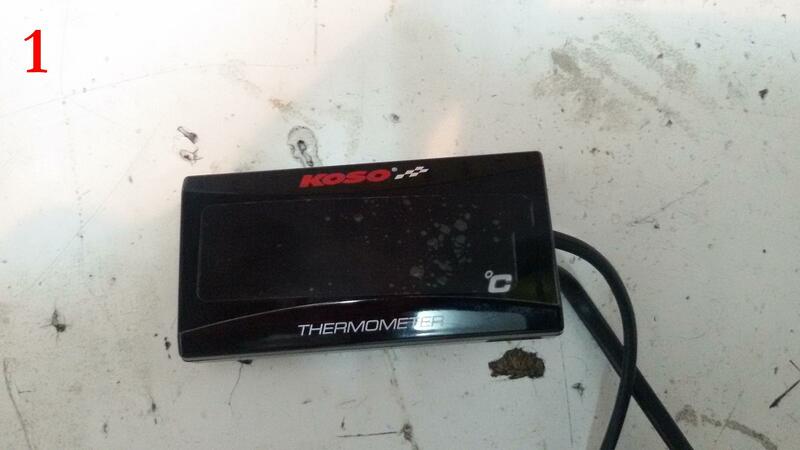 So I've proceeded to fit a KOSO water temperature digital thermometer. 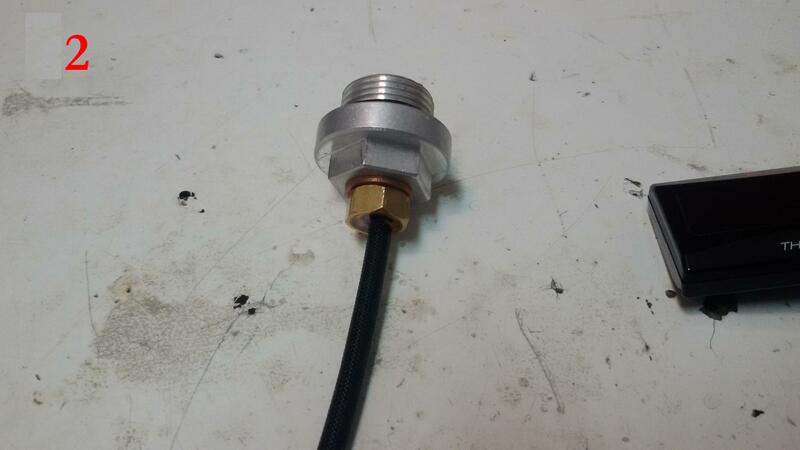 It shows 125ºC max. PIC 1. 120º is the oil working temp max advisable, I think, measured at the crankcase pan so it would be time to stop to take a rest. I've never seen more than this temp in my previous gauge, so I think there will be no problems. I have to say that the previous basic thermometer is rigorously exact when the engine is at working temperature, checked side to side with my new digital gauge. 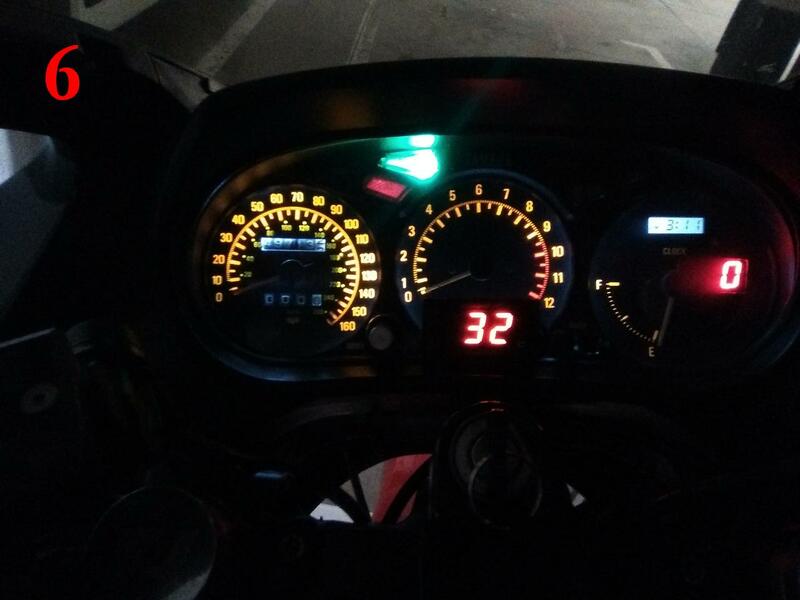 Just starting the bike, the crankcase gauge show less temperature than the digital one, but after 15 min, when the normal working temperature is reached, is exact. Great for a so basic and cheap gauge. The temperature sensor is installed inside a Allen screw cap that it is in front of the crankcase. PIC 2. The thread could be made, but I opted for buying it from RPM with the thread done (Click here). The thread must be universal because I have 2 different sensors that fit into. The main gallery screw can be seen at pic 3. 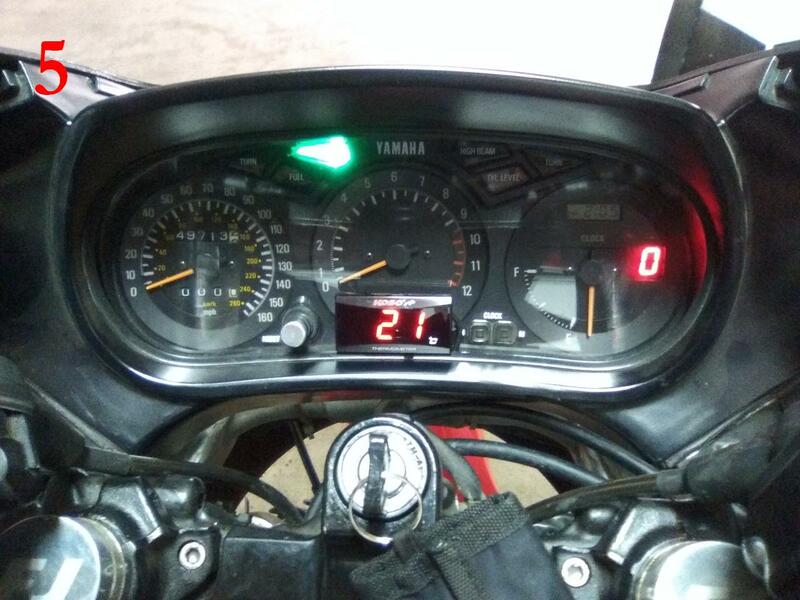 The electrical power is obtained from the rev gauge. It could be obtained from any other place, but my dashboard lights are disconnected by daylight.